Anyone who’s familiar with Warhammer knows all about Chaos. Chaos, with a capital ‘C’, is not just a descriptive term in Games Workshop’s Old World (or its 40k equivalent for that matter). A stable of dark gods, each with a differently demented tilt makes up the mini-pantheon of evil that uses the title. You know what to expect: corrupted humans, cultists, and of course demons aplenty. It’s been a while since I was an avid fan and followed the core mythos closely, but if memory serves they’ve traditionally been as big a part of the Old World as they are in 40k (the sci-fi equivalent). One thing I know for sure however is that they played a part in the end of the Warhammer world, an event that recently came to a close in the tabletop title. Now those same themes are coming to the world of video games. But Warhammer: Chaosbane does more than just carry over the recent theme. It’s also the very first action/RPG to feature the medieval fantasy version of the tabletop classic. Honestly, one of the best things about Chaosbane is just that it is an aRPG. Warhammer titles have traditionally been strategy affairs, with the odd turn-based football game thrown in. So to get a full on, action/RPG experience as well done as this one is a treat. 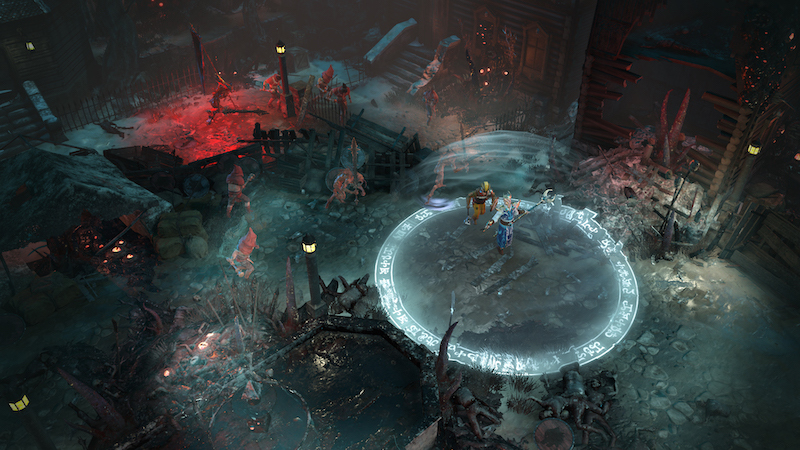 It’s clear that Chaosbane is steeped in the brine of the Old World from the first minutes of the campaign too. You’ll pick a warrior from a lot of two elves, a human, and a dwarf, then dive into a Nurgle infection that’s creeping its way through the city you find yourself in. While you tackle that threat, you’ll have to keep yourself from gawking. That’s due to Chaosbane being a great looking game. Levels are excellently detailed, with all kind of small touches. In that vein, your character’s look changes nicely as well, as you add and remove armor you find. Yes, there’s loot galore – did you think there wound’t be? I’ll add as well that the character design and animation is spot-on and above average. The heroes and creatures that make up Chaosbane are set against a well designed world, and I’m happy to report that the maps are anything but bland as well. Even in the first few areas, Chaosbane threw a solid assortment of foes at me. My warrior was beset by demons both big and small. And of course hacking into them all was easy as slicing up a pumpkin pie. Anyone who’s familiar with aRPGs should be able to pick Chaosbane up and play with ease. The game’s control scheme is both familiar and simple. In fact, it’s fairly reminiscent of certain other series’ that you’ve probably played. So there should be no issues dealing out basic damage or special attacks. What’s not looking so good? Honestly, I couldn’t find too much fault with Chaosbane. The combat though, while solid, did feel like it lacked impact. All aRPGs suffer a little from this malady, but I found the sword swings in Chaosbane to be unsatisfying. Even when blade met bone, it felt empty, like there was no blow being struck. I know that can be difficult to pull off in a game like this, but even a little extra oomph in the sound effects department could help. Hopefully that changes at least a little before the final release. It was also a little frustrating at times being swarmed by small enemies. Not that they were all that tough to beat, but it got to be a little bit of a drag. I’m not sure if some instances of that will be replaced by fewer, larger foes eventually, but I kind of hope so. My opinion of Chaosbane hasn’t changed from watching the trailers and seeing the latest batches of screens. As a big Diablo and Torchlight fan, I still really want to play this game. I couldn’t care less about the minor issues either, since they’re not exclusive to Chaosbane. More or less, I know what I’m getting with this genre. So I can definitely say that I enjoyed what I was able to play so far of this one, and I can’t wait to dig further into the campaign. It’s gone from a title that I was really looking forward to, to being one of my most anticipated games of the summer. I only wish there was a Switch version so I could take it with me. Warhammer: Chaosbane will have one more beta coming up next month (April), followed by the full retail launch on June 4th. It’ll come in a pair of editions too, with the standard and the Magnus Edition. That, of course, will have some bonuses, including the chance to play early, on May 31st. 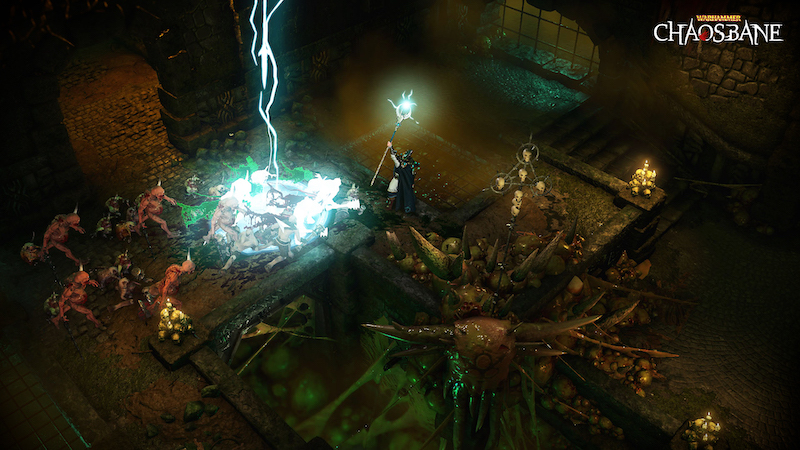 You can expect Warhammer: Chaosbane to land at retail for the Xbox One, PS4, and PC.